Penicillin (sometimes abbreviated PCN) refers to a group of β-lactam antibiotics obtained from fungi of the Penicillium genus and used in the treatment of bacterial infections caused by susceptible, usually gram-positive organisms. The name “penicillin” can also be used in reference to a specific member of the penicillin group. Likewise, it can include derivatives, such as ampicillin and amoxicillin, which have extended spectra and are effective against many gram-negative bacteria. All penicillins possess the basic Penam Skeleton, which has the molecular formula R-C9H11N2O4S, where R is a variable side chain. Fungi in general, and molds in particular, are often viewed negatively as causes of food spoilage and plant and human diseases and allergies. But in fulfilling their own individual purpose of survival and reproduction, fungi also serve a purpose for the whole. In particular, fungi provide a key ecological role as primary decomposers of dead organic matter. In the specific case of Penicillium, in addition to its usefulness in the production of cheese, it is especially invaluable as the source of antibiotics. It is estimated that penicillin has saved at least 200 million lives since its first use as a medicine in 1942. Penicillin will not work for infections causes by viruses, such as colds and flu. The serendipitous discovery of penicillin is usually attributed to Scottish scientist Alexander Fleming, though others had earlier noted the antibacterial effects of Penicillium. 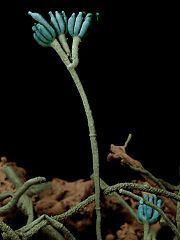 (Penicillium is a member of the deuteromycetes, fungi with no known sexual state. As it grows, it gives off the liquid referred to as penicillin.) Many ancient cultures, including the ancient Greeks and ancient Chinese, already used molds and other plants to treat infection. This worked because some molds produce antibiotic substances. However, they could not distinguish or distill the active component in the molds. There also are many old remedies where mold is involved. In Serbia and in Greece, moldy bread was a traditional treatment for wounds and infections. Sir John Scott Burdon-Sanderson, who started out at St. Mary's Hospital (now one of Imperial College teaching hospitals) in London, 1852-1858, and as a lecturer there from 1854-1862, observed in 1870 that culture fluid covered with mold would produce no bacteria. In 1871, Joseph Lister, an English surgeon and the father of modern antisepsis, described that urine samples contaminated with mold did not allow the growth of bacteria and he also described the antibacterial action on human tissue on what he called Penicillium Glaucum. A nurse at Kings College Hospital, whose wounds did not respond to any antiseptic, was then given another substance which cured her, and Lister's registrar informed her that it was called Penicillium. Louis Pasteur and Jules Francois Joubert in 1877 had observed that cultures of the anthrax bacilli, when contaminated with molds, became inhibited. Some references say that Pasteur identified the strain as Penicillium notatum. Fleming expressed initial optimism that penicillin would be a useful disinfectant, being highly potent with minimal toxicity compared to other antiseptics of the day, but particularly noted its laboratory value in the isolation of Bacillus influenzae (now Haemophilus influenzae) (Fleming 1929). After further experiments, Fleming was convinced that penicillin could not last long enough in the human body to kill pathogenic bacteria and stopped studying penicillin after 1931, but restarted some clinical trials in 1934 and continued to try to find someone to purify it until 1940. In 1939, Australian scientist Howard Walter Florey and a team of researchers (Ernst Boris Chain, A. D. Gardner, Norman Heatley, M. Jennings, J. Orr-Ewing and G. Sanders) at the Sir William Dunn School of Pathology, University of Oxford made significant progress in showing the in vivo bactericidal action of penicillin. (Bactericidal refers to inhibition of the growth or activity of bacteria, thus the prevention of infection.) Their attempts to treat humans failed due to insufficient volumes of penicillin, but they proved its harmlessness and effect in mice. Some of the pioneering trials of penicillin took place at the Radcliffe Infirmary in Oxford. On March 14, 1942, John Bumstead and Orvan Hess became the first in the world to successfully treat a patient using penicillin (Saxon 1999, Krauss 1999). During World War II, penicillin made a major difference in the number of deaths and amputations caused by infected wounds amongst Allied forces. Availability was severely limited, however, by the difficulty of manufacturing large quantities of penicillin and by the rapid renal clearance of the drug necessitating frequent dosing. Penicillins are actively secreted and about 80 percent of a penicillin dose is cleared within three to four hours of administration. During those times, it became common procedure to collect the urine from patients being treated so that the penicillin could be isolated and reused (Silverthorn 2004). This was not a satisfactory solution, however, so researchers looked for a way to slow penicillin secretion. They hoped to find a molecule that could compete with penicillin for the organic acid transporter responsible for secretion, such that the transporter would preferentially secrete the competitive inhibitor. The uricosuric agent probenecid proved to be suitable. When probenecid and penicillin are concomitantly administered, probenecid competitively inhibits the secretion of penicillin, increasing its concentration and prolonging its activity. The advent of mass-production techniques and semi-synthetic penicillins solved supply issues, and this use of probenecid declined (Silverthorn 2004). Probenecid is still clinically useful, however, for certain infections requiring particularly high concentrations of penicillins (Rossi 2006). The chemical structure of penicillin was determined by Dorothy Crowfoot Hodgkin in the early 1940s, enabling synthetic production. A team of Oxford research scientists led by Australian Howard Walter Florey and including Ernst Boris Chain and Norman Heatley discovered a method of mass producing the drug. Florey and Chain shared the 1945 Nobel Prize in Medicine with Fleming for this work. Penicillin has since become the most widely used antibiotic to date and is still used for many Gram-positive bacterial infections. The narrow spectrum of activity of the penicillins, along with the poor activity of the orally-active phenoxymethylpenicillin, led to the search for derivatives of penicillin that could treat a wider range of infections. The first major development was ampicillin, which offered a broader spectrum of activity than either of the original penicillins and allowed doctors to treat a broader range of both Gram-positive and Gram-negative infections. Further developments led to amoxicillin, with improved duration of action. Further development yielded beta-lactamase-resistant penicillins including flucloxacillin, dicloxacillin, and methicillin. These were important for their activity against beta-lactamase-producing bacteria such as Staphylococcus species, but are ineffective against the methicillin-resistant Staphylococcus aureus strains that subsequently emerged. The last in the line of true penicillins were the antipseudomonal penicillins, such as ticarcillin and piperacillin, useful for their activity against Gram-negative bacteria. However, the usefulness of the beta-lactam ring is evident from the fact that related antibiotics, including the mecillinams, the carbapenems, and most importantly, the cephalosporins, have it at the center of their structures. β-lactam antibiotics work by inhibiting the formation of peptidoglycan cross links in the bacterial cell wall. The β-lactam moiety of penicillin binds to the enzyme (transpeptidase) that links the peptidoglycan molecules in bacteria, and this weakens the cell wall of the bacterium when it multiplies (in other words, the antibiotic causes cell cytolysis or death when the bacterium tries to divide). Scott Williams is generally credited with having postulated this hypothesis. In addition, the build-up of peptidoglycan precursors triggers the activation of bacterial cell wall hydrolases which further digest the bacteria's existing peptidoglycan. The term “penicillin” is often used generically to refer to one of the narrow-spectrum penicillins, particularly benzylpenicillin. Benzathine benzylpenicillin is the International Nonproprietary Name (rINN). Also known as benzathine penicillin, it is slowly absorbed into the circulation after intramuscular injection and hydrolyzed to benzylpenicillin in vivo. It is the drug of choice when prolonged low concentrations of benzylpenicillin are required and appropriate, allowing prolonged antibiotic action over 2–4 weeks after a single IM (intramuscular) dose. It is marketed by Wyeth under the trade name Bicillin. Benzylpenicillin, commonly known as penicillin G, is the gold standard penicillin. Penicillin G is typically given by a parenteral route (routes other than through the digestive tract) of administration because it is unstable in the hydrochloric acid of the stomach. Because the drug is given parenterally, higher tissue concentrations of penicillin G can be achieved than is possible with phenoxymethylpenicillin. These higher concentrations translate to increased antibacterial activity. Phenoxymethylpenicillin, commonly known as penicillin V, is the orally-active form of penicillin. It is less active than benzylpenicillin, however, and is only appropriate in conditions where high tissue concentrations are not required. Procaine benzylpenicillin (International Nonproprietary Name (rINN)), also known as procaine penicillin, is a combination of benzylpenicillin with the local anesthetic agent procaine. Following deep intramuscular injection, it is slowly absorbed into the circulation and hydrolyzed to benzylpenicillin—thus it is used where prolonged low concentrations of benzylpenicillin are required. This combination is aimed at reducing the pain and discomfort associated with a large intramuscular injection of penicillin. It is widely used in veterinary settings. Procaine penicillin is also used as an adjunct in the treatment of anthrax. Structural modifications were made to the side chain of the penicillin nucleus in an effort to improve oral bioavailability, improve stability of beta-lactamase activity, and increase the spectrum of action. This group was developed to be effective against beta-lactamases produced by Staphylococcus aureus, and are occasionally known as anti-staphylococcal penicillins. This group was developed to increase the spectrum of action and, in the case of amoxicillin, improve oral bioavailability. This group was developed to increase efficacy against Gram-negative organisms. Some members of this group also display activity against Pseudomonas aeruginosa. Penicillins may be combined with beta-lactamase inhibitors to increase efficacy against β-lactamase-producing organisms. The addition of the beta-lactamase inhibitor does not generally, in itself, increase the spectrum of the partner penicillin. Common adverse drug reactions (less than one percent of patients) associated with use of the penicillins include diarrhea, nausea, rash, urticaria, and/or superinfection (including candidiasis). Infrequent adverse effects (0.1–1 percent of patients) include: Fever, vomiting, erythema, dermatitis, angioedema, and/or pseudomembranous colitis (AMH 2006). Pain and inflammation at the injection site are also common for parenterally-administered benzathine benzylpenicillin, benzylpenicillin, and to a lesser extent procaine benzylpenicillin. Allergic reactions to any β-lactam antibiotic may occur in up to 10 percent of patients receiving that agent. Anaphylaxis will occur in approximately 0.01 percent of patients (AMH 2006). There is perhaps a 5-10 percent cross-sensitivity between penicillin-derivatives, cephalosporins and carbapenems, but this figure has been challenged by various investigators. Fleming, A. 1929. On the antibacterial action of cultures of a penicillium, with special reference to their use in the isolation of B. influenzæ. Br J Exp Pathol 10(31):226–236. Krauss, K. (ed) 1999. Yale-New Haven Hospital Annual Report. New Haven: Yale-New Haven Hospital. Retrieved January 9, 2007. Saxon, W. 1999. Anne Miller, 90, first patient who was saved by penicillin. The New York Times, June 9, 1999. Retrieved January 9, 2007. 'Face-to-Face' Interview with Sir John Cornforth, NL, who along with his wife Rita made important contributions to the work on Penicillin during the Second World War. Freeview video and transcript provided by the Vega Science Trust. This page was last modified on 3 February 2019, at 20:16.